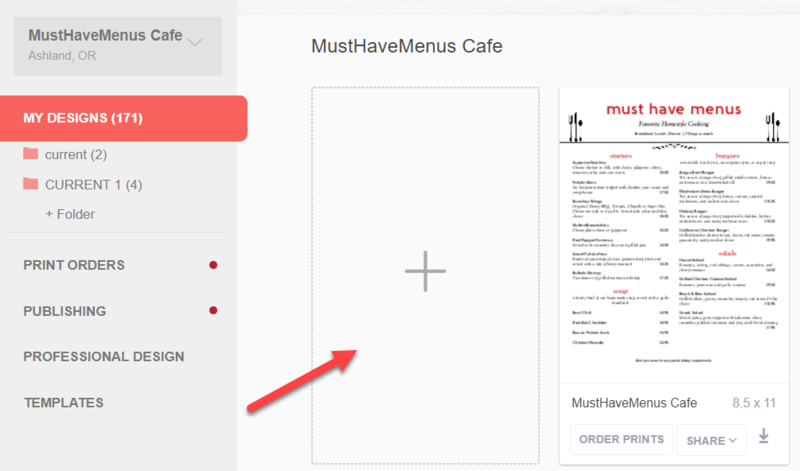 If you do not have an account with MustHaveMenus yet, get started at the menu upload page. Select a printing type, upload the file, and create a free account. To complete the print order, click "get print quote" and add the menu to your cart. If you already have an account, you can upload your menu following the same steps above, or you can upload by selecting the + icon from the My Designs page shown below. Then select the Upload PDF button that displays on the right side of the Choose A Product page. Having trouble uploading your file? Contact our Customer Service team Monday - Friday, 6 am - 5 pm PT.